You track our advice, implement it as you see fit, and tell your co-workers! In retirement savings, a little goes a long way. Increasing your annual returns by just 1.5% more annually results in 15% more wealth after just 10 years. 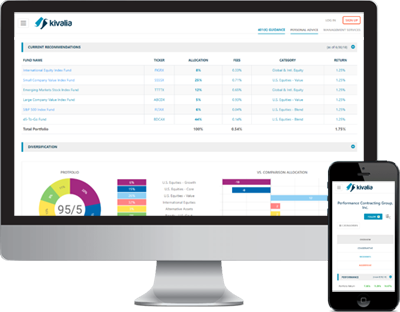 At Kivalia we build all our model portfolios on the belief that we can add meaningful value to your retirement savings, above target date and passive index approaches, over the long-term. We seek to achieve this goal by continually surveying a broad range of asset classes and tactically over–weighting markets and sectors that are temporarily out-of-favor, and under–weighting sectors that we believe to be over-favored by investors. As investor biases rotate back into alignment, our models benefit – whether that reversion occurs in 1 month, or over 5-10 years. 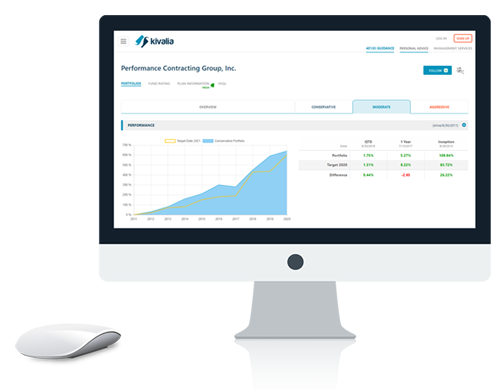 This process is applied across every plan on the Kivalia website – your 401(k), your husband’s 403(b), or perhaps a Schwab or Fidelity IRA created solely from no-transaction fee ETFs. You create a new plan or follow an existing one, we supply ongoing recommendations, and you use them as you see fit. Just as importantly, we track the performance of every model we offer against a similar risk, low cost, target date fund – so you’ll know if we’re meeting your goals, or falling short. Style Analysis provides a snapshot of the historic composition of an investment over time along with an estimate of how much of an asset’s returns have come from sector positioning versus manager investment selection. Kivalia’s asset ratings rank an asset along two dimensions – how it is performing within its primary sector, and how the sector is performing against the broad U.S. stock market. Thus, you can readily separate investments that are truly out–performing from those that are being carried along by a strong sector tailwind. Finally, a ranking of the top 100 funds & ETFs by category, updated quarterly, can be found on our investment research pages. Our letter rating captures how the fund, ETF, or stock has performed within its best fit category over the past year. Our sign ratings (++, +, -,- -) express the momentum of the asset’s best fit category against the overall U.S. market over the past year.